Implementing the communication strategy one should first of all focus on the internal activities. 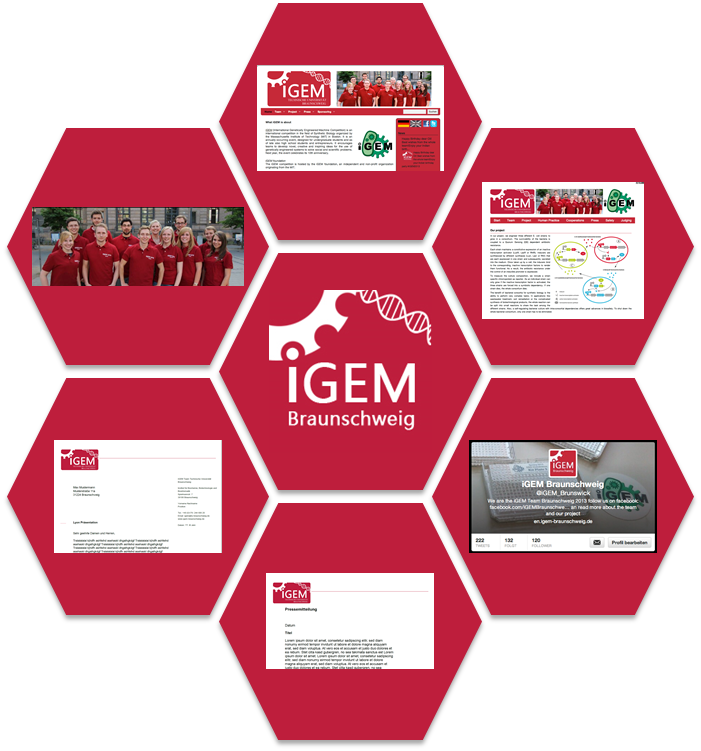 This is to say all the organizational work, as creating an own iGEM e-mail address, that helps you to better perform in the following external activities. To facilitate the communication processes among the team, a private Facebook group can be helpful. Our team used such a group to discuss and plan posts for Facebook and twitter. In a separate calendar e.g. the Google calendar, an editorial schedule can be created. 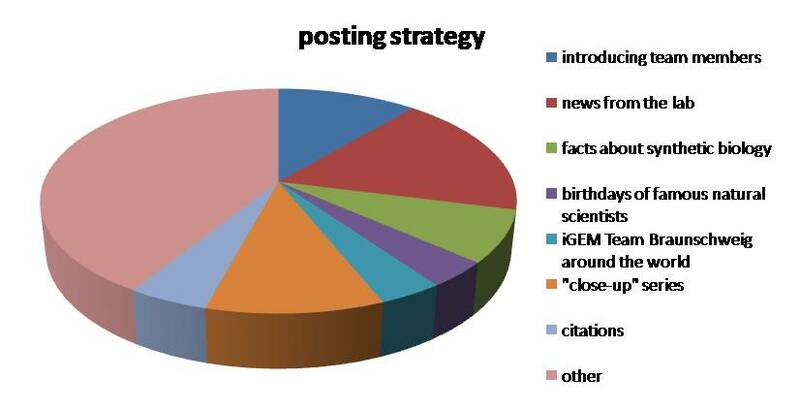 It is advisable to develop a posting-strategy with different threads of topics. We had for example the following topics: introducing all team members, news about the laboratory work, interesting facts about synthetic biology, birthdays of famous natural scientists, iGEM Team Braunschweig around the world, a “close-up”-series and citations of natural scientists that are linked to the iGEM idea. The diagram above shows which topics were posted how often to provide a diversified fanpage. the wiki, the t-shirts and letters, to just name a range of applications. As it is important to get people to know about the existence of your team and your project, you should try to persuade important stakeholders of your ideas. In the case of the iGEM competition this could be your university, your city, research institutions or companies. Last but not least also events can be used to generate news coverage. Keep in mind, that all events you plan should somehow be made public either by yourself or by journalists that you invited in advance. All activities should be accompanied by reportings on your website, on your Facebook fanpage and Twitter account and maybe by a press release. To learn more about Media Coverage Reports click here.